On the occasion of “International Right to Know Day” today, Ms Gutierrez said, “Speculation about the reasons for a decision, or the true cost of a project, has been elevated to a fine art after years of living without an access to information law. “Our country’s refinement of this skill began with generations of late night talks around the dinner table trying to pin down the true reason for such-and-such a decision. With the emergence of digital news and social media, the ability to speculate—widely, wildly, and wondrously—has reached new pinnacles of achievement. “This speculation can be engaging, until one takes a step back and comprehends the amount of energy, resources, and time that are lost to it when the public is not informed about the facts. “How different could the quality of our public debates, and our discussions about core issues important to us, be if both the public and decision makers had accurate facts and information? “The Public Access to Information, or PATI, Act finally introduced the ‘Right to Know’ in April 2015. Through PATI requests, individuals can begin to get facts about the reasons for decisions, what factors decision makers look at [or don’t look at], the true figures behind public spending, and much more. A PATI request isn’t a Parliamentary Question. “A PATI request isn’t an examination by the Commission of Inquiry. A PATI request isn’t a question from the Public Accounts Committee. “A PATI request puts Right to Know directly in the hands of the public. It’s that simple. 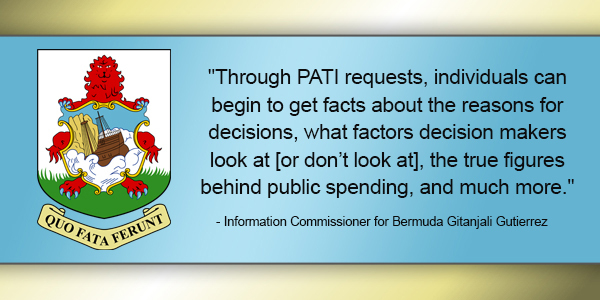 The PATI Act gives each Bermudian and resident the chance to make public life better. “For this year’s International Right to Know Day, the Information Commissioner’s Office launched a JUST ASK! campaign to raise awareness about how to make a PATI request and to encourage people to continue making them. “Each of you can ask for public records about things like health care, employment, public spending, the environment, education, public contracts, and any other issues that are important to you. “In March 2016, 79% of residents 18-years-old and older felt that PATI rights are important to them. Yet, 55% were unlikely to make a PATI request. “To help encourage people to use their Right to Know, we launched our JUST ASK! campaign. You will see and hear our awareness video, radio ads, social media engagements, and JUST ASK! information tables this week as part of the campaign. “Our future leaders will enter public life having grown up with the Right to Know in their hand. For these young people and schoolchildren, the ability to know the facts behind public decisions and spending will be as routine a part of public life as the right to vote. “Can you begin to imagine that future? We can. And we aim to support those in our community and in the public bodies who are reaching towards that goal. “Are we there yet? No. Much work remains. The Right to Know is a robust, legally enforceable right, but currently one that moves slowly at times. It is also not yet possible to file a request anonymously, a critical protection in smaller jurisdictions such as ours. “We also need to improve the records collection, storage, and management practices for some public bodies so that public records are correctly managed and can be located easily in response to a PATI request. “We have just begun to take steps towards a time when the Right to Know is not feared or disparaged, but embraced by all as an important tool for our democracy. Ill pass, look what happend to Walter Brown. Unless of course, the request is denied. Really….what do you have to hide? The OBA should rename it. (PATSI)…….Public Access to Some Information. Don’t kid yourself folks each Ministry doesn’t release all the information/answers you want. A person after receiving the information back is left with more question then answers. The Department is a waste. Been there done that. Just shows that you need to have sharper questions. Think about what you got back and then ask more precise questions. How does this right to know work when the economic systems we create and promote are based upon power and control with the right to secrecy at the centre? How is our charitable institutions modeling the many issues raised recently in the US about the Clinton and Trump Foundations? How do we protect ourselves from the back door influence of secret funding under the false optics of serving the greater good? What right does the Bermuda public have to know around the allocations of secret donated funds for projects such as Preserve Marriage, Political Party donations and other well funded initiatives that seek to influence our laws and Government policy? PATI applies to government and quangos. Charities are not covered but there is a list of charities that receive government financing. See the annual estimates book. PATI is fantastic. No longer can public authorities operate behind a cloak of secrecy with impunity. The only reason for public authorities to not embrace PATI is because they are not operating within the law, policies and with transparency. I am glad to see that decisions rendered by the Information Commissioner are now being displayed on the ICO website. Well the present airport deal seems to be operating behind a cloak of secrecy & it seems a lot of effort is being made to keep that secrecy in place. I can’t believe there are so many moany, negative and pessimistic in Bermuda. Hmmmmm… So the current government object the inquiry into the airport deal… The Port Royal deal no one has objected to the inquiry…. Whose hiding something here? lol ….